A pigeon's diet consists primarily of seeds, but it also eats many other foods such as berries, vegetation, and even an occasional small mollusk or bit of seaweed. City pigeons thrive on the weed seeds in vacant lots and, unfortunately, on the grass seed in newly sown lawns; on spillage from bird feeders supplemented by human handouts of bread crumbs, doughnuts, and the like; and on discarded food in human refuse. Pigeon defenders assert that these birds are very good scavengers and really help to clean up city streets. Here is a close-up of the shrub. The fruit is described as "a round drupe or berry, red, black, or yellow, with stalkless stigmas, bitter pulp, and 3-5 nutlets." There are a few cultivars of inkberry; of the 'Nigra,' Online Plant Guide writes that "some birds eat the fruit." The cultivar is a host plant for butterfly larvae according to the Fowler's Nursery and Greenhouses website. I'll have to keep a close eye on this hedge of inkberries. For an excellent natural history of the Ilex glabra, read "Ilex glabra-The Inkberry Holly" by Michael A. Dirr and John H. Alexander III. 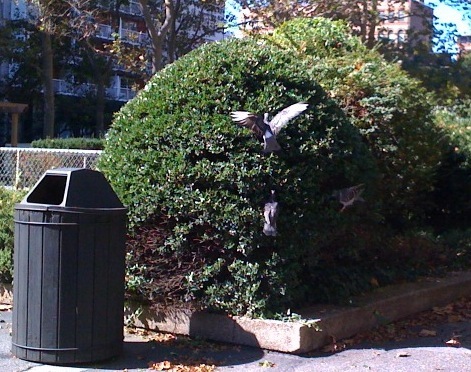 And let me know - in the comments - if you've observed pigeons eating from shrubs! p.s. Check out the video of pigeons drinking water here. Seems like it though the species always ate fruit. It's just easier to eat crumbs in a city. Nice photographs of the pigeons in the hackberry crown.